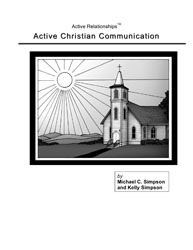 Active Christian Communication is the first curriculum written by Kelly Simpson and takes a leisurely approach through a 14 to 16-hour program. It is intended for couples at any stage of their relationship seeking to build great communication skills, conflict resolution skills and foster successful and positive attitudes. It teaches emotion management and builds understanding and compassion while assisting couples with skills and awareness to appreciate one another. It is written from a Christian lens and includes Biblical references – Authored by Michael C. Simpson and Kelly Simpson, MA, LMFT.